Following a drama-filled weekend with seven teams in the hunt for the NL and AL Wild Card spots and a host of potential tiebreaker games, ESPN ended up with exactly what it was scheduled for: a lone NL Wild Card Game to determine who will advance to play the Chicago Cubs in the National League Division Series (NLDS). ESPN, which would have exclusively televised any play-in games, will once again lend the big-game treatment to its MLB finale, adding several new production elements to its already robust Sunday Night Baseball coverage. With tiebreakers now firmly in the rearview mirror, ESPN’s sole focus is on the Giants-Mets NL Wild Card telecast from Citi Field on Wednesday night, which will feature added elements: notably, an RF handheld MōVI gimbal system with a Sony HDC-P1R camera, additional high-speed and robotic camera systems, and an onsite set for Baseball Tonight and SportsCenter on the Road — totaling three hours of pregame programming. Although no tiebreaker games were necessary, ESPN’s operations team was nonetheless prepared for any number of scenarios to play out in both the National League and American League (ESPN holds exclusive rights to any play-in games for each league). Wednesday’s NL Wild Card production will feature more than 40 cameras feeding into NEP’s EN2 mobile unit, according to Horrell. For the second consecutive year, ESPN will roll out a MōVI M10 RF handheld three-axis gimbal system for its Wild Card Game coverage. However, this year, the system will be outfitted with a Sony HDC-P1R camera and will feature a new RF transmission system (courtesy of 3g Wireless) that allows full control of the camera from the truck. ESPN will also add a fourth Sony HDC-4300 high-speed camera to its standard SNB complement of three (at low third, low first, tight centerfield, and mid first down the line), as well as an additional Fletcher robo (totaling four). ESPN will also deploy a staple of this season’s SNB coverage, the Phantom 4K Flex ultra-slo-mo camera (integrated with an Evertz DreamCatcher production/replay system for 4K zoom extraction), for its Wild Card coverage. A TVU Networks’ bonded-cellular–transmission TVUPack, which ESPN has used across all its MLB windows this season, will also be on hand. The TVUPack content can be sent to the truck or directly to ESPN’s control room in Bristol, CT, depending on the application. ESPN will provide three consecutive hours of NL Wild Card pregame coverage onsite at Citi Field, including two one-hour episodes of Baseball Tonight at 5 p.m. ET (ESPN2) and 7 p.m. (ESPN). 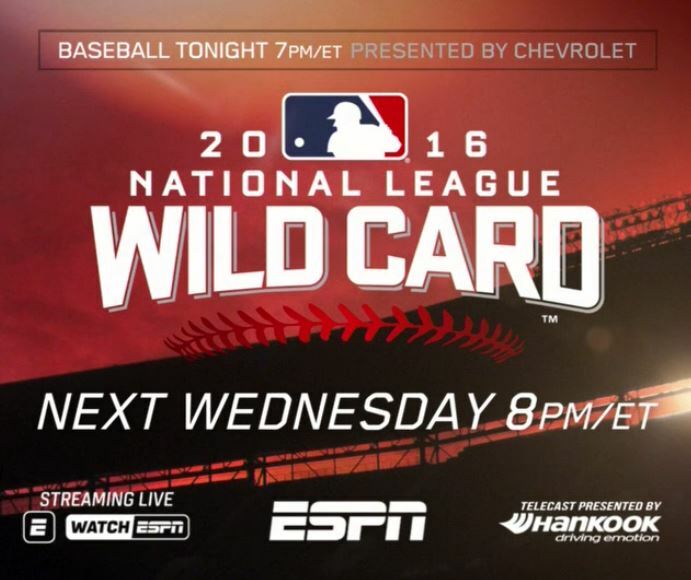 Additionally, the NL Wild Card Game will be part of the expanded SportsCenter on the Road coverage, providing live onsite updates throughout the day on Wednesday, including within the 6 p.m. SportsCenter. Since launching an eight-year MLB rights deal in 2013, ESPN’s Sunday Night Baseball product (and its MLB coverage as a whole) has undergone a significant makeover both in front of and behind the camera. Although on-air changes in the booth have dominated the mainstream headlines (analysts Jessica Mendoza and Aaron Boone are completing their first full season with SNB vets Dan Shulman and Buster Olney), production changes behind the scenes — the launch of NEP’s state-of-the-art EN2 mobile unit, use of the Sportvision K-Zone virtual graphic on every pitch — have had an equally important impact on ESPN’s MLB coverage. Another significant behind-the-scenes change has been ESPN’s increased use of at-home production workflows, which allow crew and resources to be located in Bristol. Although ESPN has controlled its ART (Advanced Replay Tool) virtual-telestrator operations from Bristol via IP for multiple years, ESPN began testing workflow in which the graphics servers are onsite in the truck but the graphics operator (for scorebug and Vizrt inserts) is in Bristol.